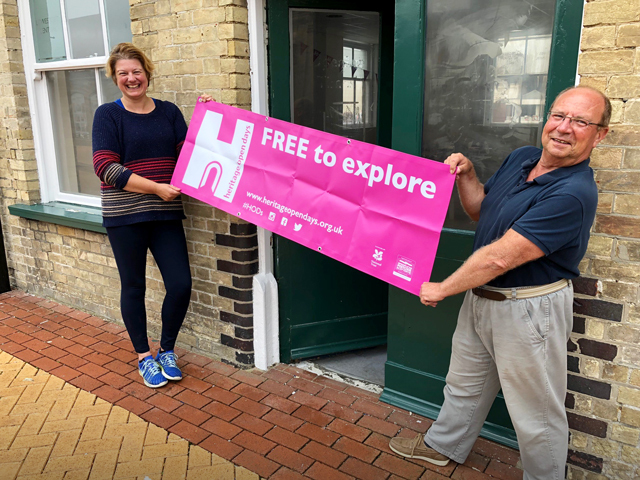 Diana Moore, Vice Chair, Lowestoft Heritage Open Days, and Paul King, Chair, Lowestoft Heritage Open Days, getting ready for explorers. Lowestoft’s iconic Railway Station is to become the headquarters for one of the country’s biggest and most comprehensive heritage events as part of a community rail scheme to find new use for vacant buildings. The town’s Heritage Open Days Festival which takes place over two weekends from September 6, will base their activities and box office at the station as part of train operator Greater Anglia’s Community Space initiative. Lowestoft Heritage Open Days will feature many of the town’s historic buildings opening to the public including the Town Hall, Port House and Royal Norfolk & Suffolk Yacht Club along with a host of other attractions including public buildings, private homes, churches, towers, cellars, boat building college and art galleries, as well as boats, fish merchants, museums, shops and theatres. In addition, there are special window displays and a chance to look around the lifeboat station. The team behind the festival have arranged some seventy free events and activities and will be utilising the former station shop as this year’s festival Box Office and showcase for the many and varied events that will be taking place. With such an extensive programme, the Lowestoft festival has been placed within the top 20 busiest locations out of some 800 participating towns and cities across the country. Visitors can call in at the station any day during the festival between 9am & 5pm to find out everything they need to know about this year’s events. The team will also be providing free festival guides, trails and maps, as well as taking bookings for any events that require free tickets. Lowestoft Station is currently undergoing restoration works as part of a major initiative by the East Suffolk Lines Community Rail Partnership. Working in conjunction with Greater Anglia, the Railway Heritage Trust, Wherry Lines CRP and the Association of Community Rail Partnerships, the project has so far seen land to the south of the station cleared and secured, additional parking spaces and resurfacing, a heritage painting scheme, specially commissioned Victorian style lighting has been manufactured and is due for installation soon with former doorways leading from the station concourse set to be restored and reopened after more than a quarter of a century. This Autumn work begins on converting the former station Parcel Office into a new public exhibition space. In 2016 the East Suffolk Lines Community Rail Partnership opened a Visitor Information Centre at the station which will also be open throughout the town’s Heritage Open Days festival. A number of walks and exhibitions are also taking place during the festival including a guided history or for those brave enough, a ghost walk. Exhibitions include one by Associated British Ports, an RAF centenary display along with photography featuring damage to the town over two World Wars. Other festival highlights include re-enactors in period dress, community singing, a day of history talks, historic re-enactments including a 1914 Suffrage Society Meeting, a one-off preview of Pearls from the Grit, a special talk and presentation about the infamous Lowestoft witch trials, a concert by the Blyth Quartet, readings by local authors, folk and classical music, recitals plus literary and anecdotal pieces featuring the works of authors and composers including George Borrow, Benjamin Britten, Edward Elgar, Rudyard Kipling, Liza Lehmann and Arthur Ransome.